In the highly demanding and competitive fashion apparel world where the profit margins are shrinking and buyers are placing increased demands for high quality, reliable products on a cheaper price. The increasing cost pressure making it more difficult for manufacturers to maintain the quality and reliability. Traditionally, quality and reliability has been achieved through extensive quality inspections and the final product inspection on AQL. These are techniques done in the late stages of development. The challenge is to design in quality and reliability early in the development cycle. FMEA is a qualitative and systematic tool, to help anticipate what might go wrong with a product or process, and then to create plans to mitigate the risk of failure. Analyzing potential reliability problems early in the development cycle where it is easier to take actions to overcome these issues, thereby enhancing reliability through design. The early and consistent use of FMEAs in the design process allows designing out failures and producing reliable, safe, and customer pleasing products. FMEAs also capture historical information for use in future product improvement. 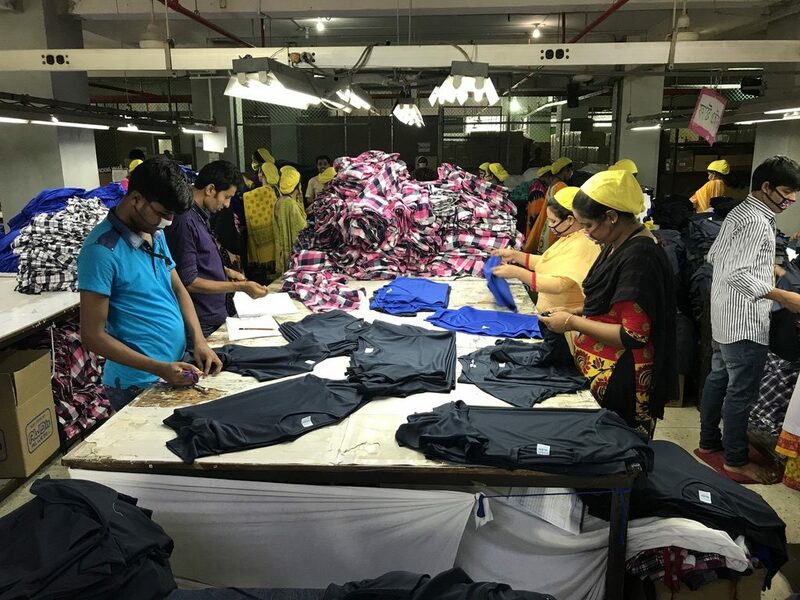 Many garment factories now a days started practicing lean and six sigma concepts to get better quality on low cost and with better efficiency. Improve product/process reliability, quality, and safety. Reduces process development time, late changes and associated cost. Calculate a final RPN: Re-evaluate the possible failures once improvements have been made and determined the improvement’s impact on the new product and customer. Select a process to analyze, design, process, workmanship or any other area? What are the limitations? How detailed should we be? You can use flowcharts to identify the scope and to make sure every team member understands it in detail. Select team facilitator and team members. A cross-functional team of people with diverse knowledge about the process, product or service and customer needs. Functions often included are: design, production, quality, testing, R & D, maintenance, store and merchandising. For each function or process, identify all the ways failure could happen. These are potential failure modes. For each failure mode, identify all the consequences on the system, process, related processes, product, and customer requirement or process limitation. These are potential effects of failure. Determine how serious each effect is. This is the severity rating, or S. Severity is usually rated on a scale from 1 to 10, 1 being not severe at all and 10 being extremely severe. Ensure the team understands and agrees to the scale before you start. For each failure mode, determine all the potential root causes. 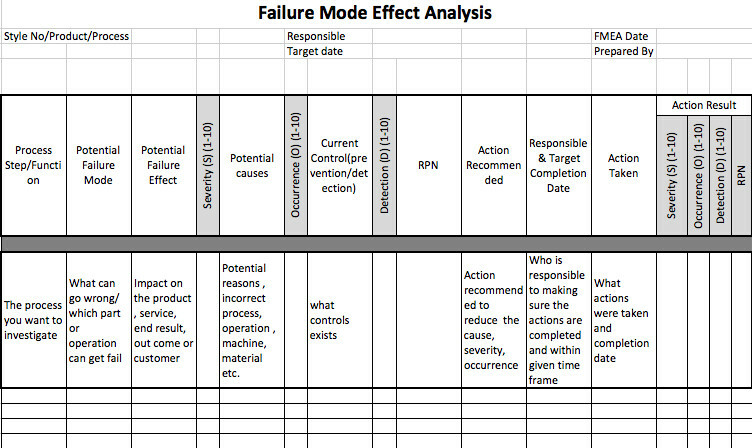 List all possible causes for each failure mode on the FMEA form. For each cause, determine the occurrence rating, or O. This rating estimates the probability of failure occurring for that reason during the lifetime of your scope. Occurrence is usually rated on a scale from 1 to 10, where 1 is extremely unlikely and 10 is inevitable. On the FMEA table, list the occurrence rating for each cause. For each control, determine the detection rating, or D. This rating estimates how well the controls can detect either the cause or its failure mode after they have happened but before the customer is affected. Detection is usually rated on a scale from 1 to 10, where 1 means the control is absolutely certain to detect the problem and 10 means the control is certain not to detect the problem (or no control exists). On the FMEA table, list the detection rating for each cause. Calculate the risk priority number, or RPN (S × O × D). Also calculate Criticality by multiplying severity by occurrence (S × O). These numbers provide guidance for ranking potential failures in the order they should be addressed. Ø Identify recommended actions. These actions may be design or process changes to lower severity or occurrence. They may be additional controls to improve detection. Document the changes to the product. Ideally, the results of completed actions will reduce the risk. Assign a team member who is responsible for the actions and target completion dates.